Pankaj Ghemawat of the IESE Business School at the Univesity of Navarra in Spain, together with Steven A. Altman, is the author of the DHL Global Connectedness Index 2012. The report has a lot of interesting angles for looking at the extent of globalization in recent years, but I was especially interested in an argument I've made a few times--that while globalization has definitely increased by historical standards, the movement toward globalization is nowhere close to complete, and has in fact stalled in the last few years. The report looks at many dimensions of global connnectedness: here, I'll focus on international flows of goods and services, flows of capital, and international flows of communication and information. For international flows of goods and capital, this figure shows total exports of goods and services as as share of world GDP. 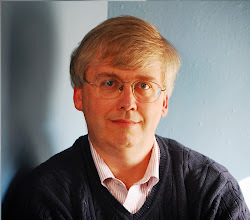 Of course, the estimates from the 19th century and first half of the 20th century are based on less data, but the overall patterns are clear: a first wave of 19th century globalization that lasted up until about the start of World War I, the stagnation or even decline of globalization until after World War II, and then the second wave of globalization since then. Globalization is near an all-time high by this measure, but notice that it after the drop associated with the Great Recession, this measure of globalization is about the same in 2011 as it was in 2007. A couple of other thoughts to help put this figure in perspective. While the levels of exports/world GDP is high by historical standards, there's still a lot of room for it to expand further. As the report says: "Furthermore, while 20% (or even 30%) of goods and services being traded across borders is far more than the same ratio mere decades ago, it is still far short of the 90% or more that one would expect if borders and distance did not matter at all. If the world truly became “flat,” countries’ exports-to-GDP ratios would tend toward an average of 1 minus their shares of world GDP since buyers would be no more likely to purchase goods and services from their home countries than from abroad. Borders and distance still matter a great deal, implying that even the most connected countries have substantial headroom available to participate more in international trade." 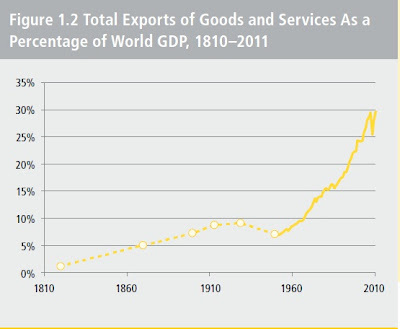 [F]ocusing on trade in goods only rather than goods and services combined, as of 2011, 47% of trade took place between countries in different regions rather than within the same region, a proportion that has typically been between 40% and 50% since 1965. 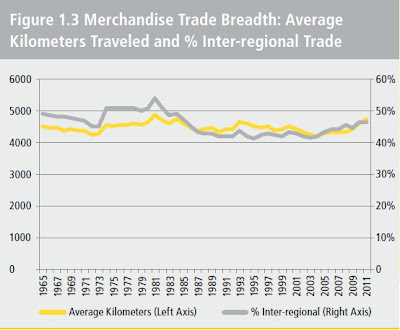 The average distance traveled by a dollar worth of traded merchandise in 2011 was roughly 4,750 kilometers, also in line with historical norms over the past four decades ... 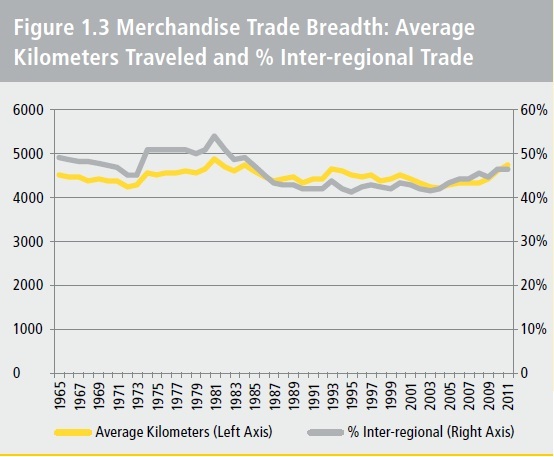 Thus, while the depth of merchandise trade (the volume of goods traded in comparison to total economic output) has scaled new heights in recent decades, that trend has not been matched by an extension of the distances traveled by traded goods on average. Rather, much of the action in terms of trade integration has been the weaving together of national economies within the same region." When it comes to flows of foreign direct investment, a similar pattern holds: it's at an historically high level, but it's still recovering from the Great Recession. Here's the figure. 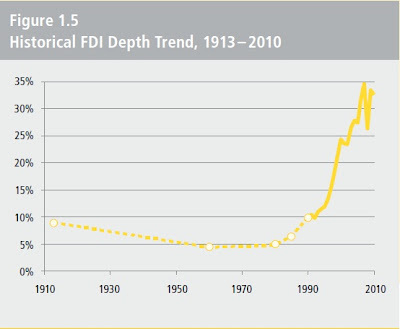 More detailed analysis shows that the "breadth" of foreign direct investment, as measured by gthe range of different countries receiving such investment, has declined since 2007.The report expalins this way: "This pattern of declining breadth scores was not matched by declines in the average distance “traveled” by FDI or the proportion that occurs between rather than within regions. 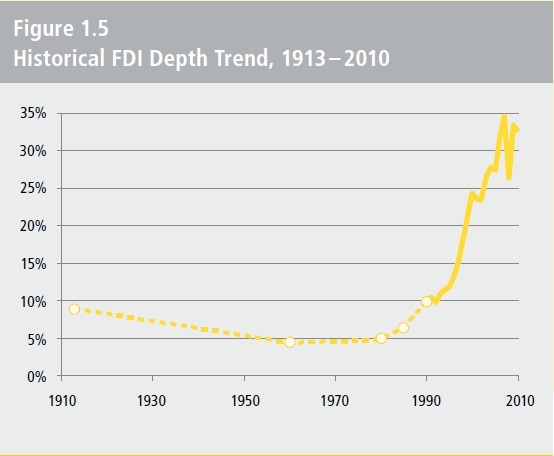 depth), they are not generally shifting their foreign investments from distant countries to neighbors. Rather, they are selectively choosing a narrower set of investment destinations, some of which may be distant safe havens, selected in part to diversify risks in investors’ home regions." "While new technologies indeed have made it far easier and cheaper to share information with people on the other side of the world, we actually tend to use these technologies much more intensively to connect to people close to home. Consider, first of all, postal communications. As a result of efforts spearheaded by the Universal Postal Union, organized in 1874 and one of the world’s first global institutions, it has long been fairly simple to send mail anywhere in the world. And yet, only about 1 percent of all letter mail sent around the world is international. "While the growth of international internet bandwidth implies that we can just as easily read foreign news websites as domestic ones, people still overwhelmingly get their news from domestic sources when they go online: news page views from foreign news sites constitute 1% of the total in Germany, 3% in France, 5% in the United Kingdom and 6% in the United States (and are in single digits everywhere else sampled – as low as 0.1% in China). Furthermore, news coverage by domestic sources itself tends to be very domestic. In the U.S., 21% of U.S. news coverage across all media was international according to a recent study, and of that 11 percent dealt with U.S. foreign affairs (such as U.S. diplomacy and military engagements), leaving only 10% of coverage for topics entirely unrelated to the U.S."
"The United States ranks 20th overall [in global connectedness] and has the world´s second highest breadth score, reflecting its significant ties to nearly every other country around the world. It has a more modest rank on depth (89th), which is not unusual for a country with a very large internal market. The U.S. has its strongest position on the capital pillar on which it ranks 6th overall and 1st on breadth. On the other hand, the U.S. has a remarkably low score on the trade pillar, 76th overall and 139th (next to last) on depth. 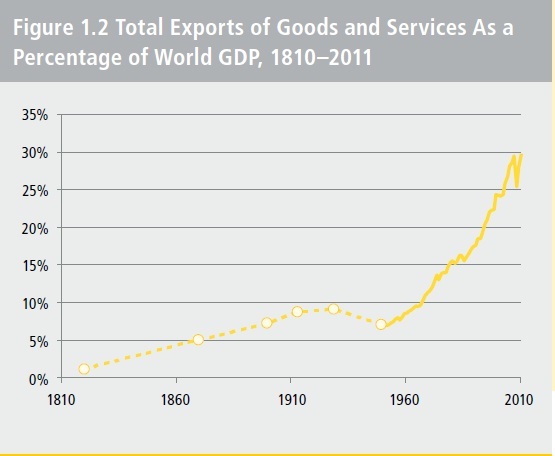 Merchandise and services exports account for only 14% of U.S. GDP and imports add up to only 18%. The U.S. has maintained a stable level of connectedness since 2007." "[I]n calculating the benefits of additional trade, these kinds of models focus almost exclusively on growth generated by reductions in production costs as each country’s output becomes more specialized, a limited fraction of the potential gains. To broaden the range of benefits covered, consider a modified version of the ADDING Value Scorecard, a framework originally developed to help businesses evaluate international strategies. ADDING is an acronym for the following sources of value: Adding Volume, Decreasing Costs, Differentiating, Intensifying Competition, Normalizing Risk, and Generating and Diffusing Knowledge. Because traditional models assume full employment (especially problematic in times like these) and leave out scale economies, they capture only part of the gains in the first two categories, Adding Volume and Decreasing Costs. And they entirely leave out the last four categories, whose benefits can be seen clearly, for example, in the U.S. automobile industry. Decades ago, Japanese automakers started offering consumers differentiated (more reliable) products. Increased competition prompted U.S. automakers to improve their own quality. Now, GM sells more cars in China than in the U.S., diversifying its risks and helping it recover from the crisis. And cars are becoming “greener” faster because of international knowledge flows." Taking these sorts of factors into account, the report estimates that reasonable expansions of globalization could generate gains on the order of 8% of world GDP: in round numbers, call that $5 trillion or so per year in benefits. A final note: My discussion of the report touches on some of the main points that caught my eye, but completely leaves out other points, like discussions of specific countries, of regional differences, international migration, industry studies of mobile phones, cars, and pharmaceuticals, and more. Thus, those interested in additional detail and insights will find a lot more in this report.